The end of the affair … ? And so, and I type this with a sense of sad inevitability, it’s all gone a bit Pete Tong. Reunions can be tricky. We were told that this one was always meant to be short term and it’s often best not to drag it out too long, especially if there is no prospect of new material. It could end up like The Pixies, or looking like a Loop tribute band – Hoop? Loopy? There have been loads of reunions in recent years; Chapterhouse, Swervedriver, The Telescopes et al. We’re threatened with the prospect of a Slowdive reunion, but that’s just too awful to contemplate. Slowdive really were the dullest band ever (IMO). But I’m so glad that I got to see Loop again. I’d never expected to and it’s been such fun (for me). And it has reinvigorated my interest in music (I’m soooo out of touch) so, for me at least, it’s not all about looking back. There are still some gigs to come in North America and at Roadburn, but no more (yet?) announced for the UK. I’d go of course. How could I resist? I’m powerless to resist, but I’d miss John. He’s cool. He’s one of the ‘classic’ Loop line-up and I want him to be there, even if I am too short to be able to see him behind his kit. But at the end of the day he has to do what is right for him. Reunions can be tricky you see. I’ve had a love affair with Loop for more than a quarter of a century (crikey! How old am I?). Yes, it’s been a rather one-sided love affair, but that’s ok, and I don’t want it to end. This recent live jaunt has been like one last brief moment in the sun…if the sun was at night… and really noisy…and mostly obscured by dry ice. Well you get what I mean. A gorgeous, heart pumping, heart stopping aberration. A last mad moment of joyous Loop-y goodness. Whatever happens next we’ll always have the music. So, People of Loop, if you do ever read this, whatever your differences, together you created something beautiful, so thanks for that. This entry was posted in Loop, Music and tagged Freakin'awesome, indie nonsense, John Wills, Loop, Neil Mackay, Robert Hampson, Scott Dowson, Soundheads. Bookmark the permalink. Loop will be appearing just down the road from my place in April. You are welcome to come crash on the sofa. We will be walking the Cornwall coast by then. No parties, young lady! Tempting, and thank you for the offer, but if I were to show up at a gig in America, I’d really look like some kind of deranged stalker! Which gig is down the road from you anyway? I’m sorry but my grasp on the geography of the US is very tenuous. Saint Paul MN. Find Chicago and start walkin’ northwest to Minnesota. Brother Fred lives half an hour away. I am about 90 minutes. Um….you can tell when I am not being entirely serious, no? If not, then just assume my default mode is silly unless discussing Death, Children or Baseball. Perhaps I shall call your bluff young lady….Fred and Marty would be happy to have you over. Their dog Billy will grovel at your feet. Just be back in time for Jet Lag Drinks night at the Twicey on 4 May. I will content myself with all the awesome Loop-y goodness that I’ve already absorbed, and with cranking my (admittedly antiquated) stereo up to 11. And you can rest assured that I will present myself, front and centre, in the aforementioned hostelry at the required time, as instructed. 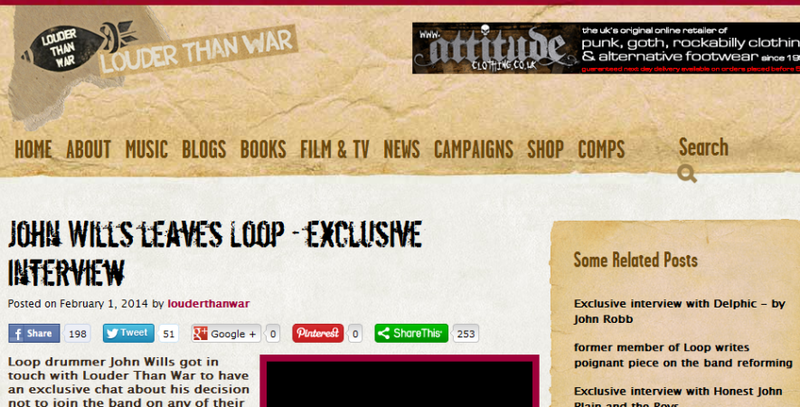 As anticipated, there’s more Loop coming up for me to enjoy. A little while ago they announced some dates by a classic double-headed – Loop / Godflesh in London, Leeds and Glasgow (in June), and a couple of warm-up dates for Roadburn and the US tour in Bristol and Birmingham. There’s also a gig scheduled in Paris in June, which has set me off on a little jolly. Look out for gig/trip reports later in the year.